I have a small scar on my right ankle. When I was a precocious scamp, just under two years old, I clambered my way up onto the countertop, stuck my feet into the sink, and turned on the hot water. I’ve had better ideas since then. 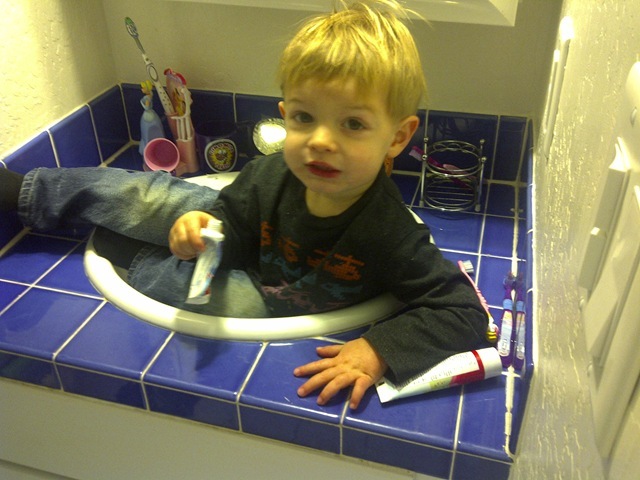 Adrian has figured out that he can sit in the sink and eat toothpaste. It’s not a discovery I ever would have expected. Who would think “Someday my son is going to want to eat all the toothpaste in the house”? Maybe you would have thought of it. Monkey. Just like his dad. Ah, but carrying that scar around with me my whole life taught me one thing. As soon as we moved into this house I turned off the hot water valve for that sink. Lesson learned and implemented, Childhood Injury. mmmm, hook that kid up with some Aquafresh! Ninja Toddler does the exact same thing. He's almost three and a half and will randomly sit in our bathroom sink, usually eating toothpaste. He has figured out how to open the kid-proofed drawers to get to his beloved Closeup toothpaste. When he was around two he would constantly have the toothpaste in his mouth, so we had to hide the toothpaste inside a shoebox in our closet. He's also a climber – we have taken him off kitchen counters countless times. Part of the reason his nicknames are Ninja Toddler and Monkey Boy. I think I'll blame his father for the Monkey Boy traits – it obviously has something to do with that Y chromosome. LOL That must have been one big "facepalm" moment for you! It's a good thing it was just toothpaste though. I remember reading blogs about kids being able to reach and drink down a full bottle of cough medicine syrup – it was nasty! LOL That must have been one big “facepalm” moment for you! It’s a good thing it was just toothpaste though. I remember reading blogs about kids being able to reach and drink down a full bottle of cough medicine syrup – it was nasty!